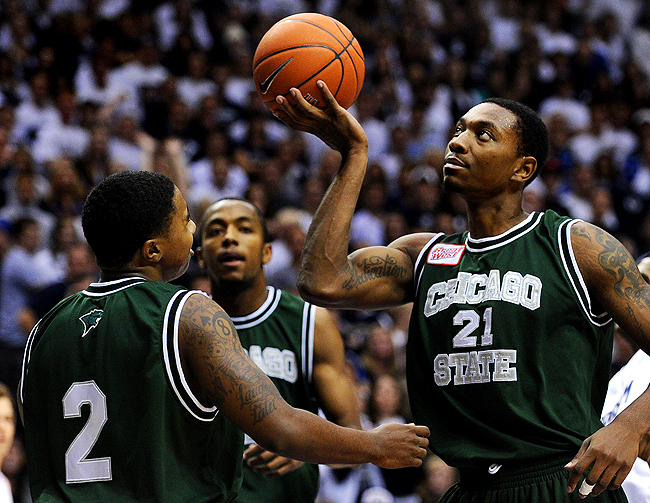 What’s next for Chicago State? Matt Ross (42) is one of eight seniors that are graduating from Chicago State in May. The men’s basketball program at Chicago State University has made some buzz over the past two seasons. It started in 2013 when they won the Great West Tournament (their first ever conference title) and played in the College Insider Tournament (their first ever postseason bid). Then during the offseason they joined the Western Athletic Conference upon the dissolution of the Great West. A new conference and a new year meant new challenges. The Cougars met some of those challenges head-on. The finished the season with a 13-19 record (8-8 WAC), good enough for a third place finish in the league, and the No.3 seed in the WAC Tournament earlier this month (their best conference finish in school history). Unfortunately, they were eliminated in the first round. They didn’t make it back to the postseason this year. On the bright side though, the last couple of years have made CSU into a program on the rise. But that rise could be slowed down, at least temporarily. The main reason for this program’s ascension over the last two years is the hard work and leadership of their experienced seniors. Forwards Matt Ross, Eddie Denard, Aaron Williams and Markus Starks along with guards Quinton Pippen, Jamere Dismukes, Nate Duhon, and Corey Gray are all graduating this year. That’s eight players total that head coach Tracy Dildy will have to replace and mold into the next group of stars. That task will be a lot easier said than done, especially in the competitive WAC conference where every team is a legit contender. But replacing the players won’t be as difficult as replacing the production. Ross (11.9 points per game) and Pippen (15.2 PPG) were two of the teams top scorers this season. Ross was also the team’s leading rebounder (7.5 RPG), while Pippen was the second leading assist man (2.5 APG). The rest of the seniors were all important role players while Dismukes was limited due to injury. So there will be somewhat of a rebuilding process for this team, it’s just a matter of how long it will take to complete. The good thing is that coach Dildy will have two players who he can depend on for leadership right away next season. Those players are guards Clark Rosenberg and Rahjan Muhammad. Rosenberg was CSU’s second leading scorer (14.0 PPG) and leading assist man this season (2.6 APG). As for Muhammad, he averaged 23 minutes per game off the bench and finished the year as the team’s sixth leading scorer at 5.8 points per game. Coach Dildy will also have seven other players returning, plus whatever new recruits are coming in next fall. If CSU can keep the talent pool coming in, and if they can continue to play consistently, they could push for a postseason tournament again in 2015.